I felt there was a real need for it! When I first started growing chillies, I couldn't get the information I needed in time to save my sick plants. Through my years of growing, I've seen that peppers are prone to a lot of particular issues that can bring them down quick. I started keeping detailed records about what these problems looked like and what the exact remedy was for each situation. And frankly, I can be an impatient person. When my peppers show signs of distress, I don't want to do a bunch of reading... I just want to fix them right away. That's exactly what my notes help me do. After I spot something, I'll check the guide, and in a few minutes, I usually have a good idea of what's going on and what action I need to take. Originally, I intended my notes to just be a personal reference, but I get a lot of questions from visitors and email subscribers. I realized so many of the answers to those questions are found in my notes so I turned it into The Chile Plant Hospital. This ebook has recently been updated to make it even more useful for you. I hope you'll check it out! Thanks so much for reading! ​​What's Happening To This Plant? ​One day peppers seem to be fine, and seemingly overnight, they're no longer healthy. You can lose months of hard work. That's a frustrating situation to be in. ​It's not your fault! Factors beyond your control can easily take down a healthy plant. Insects, current weather conditions and even too much water or fertilizer are all common culprits. 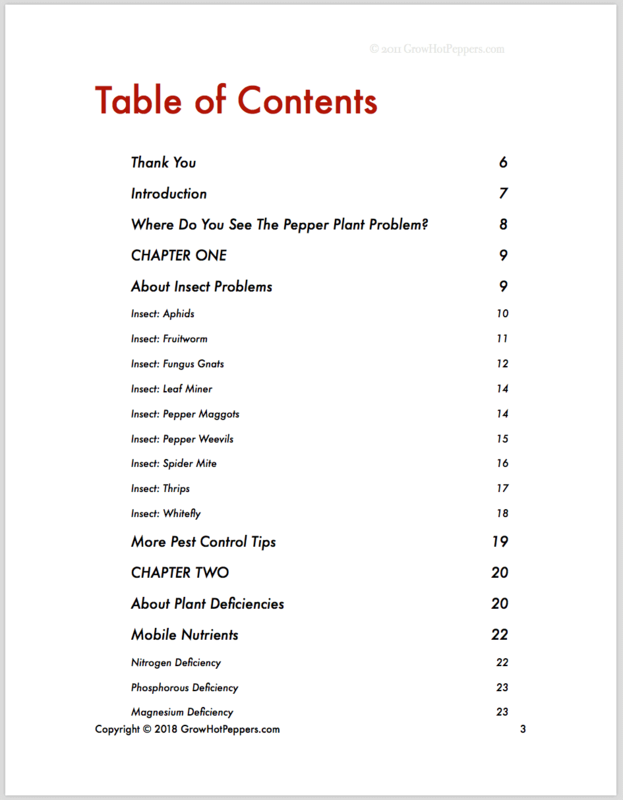 ​The Chile Plant Hospital is a troubleshooting guide that helps you identify pepper plant problems, and it gives you the exact remedy you need in each situation. 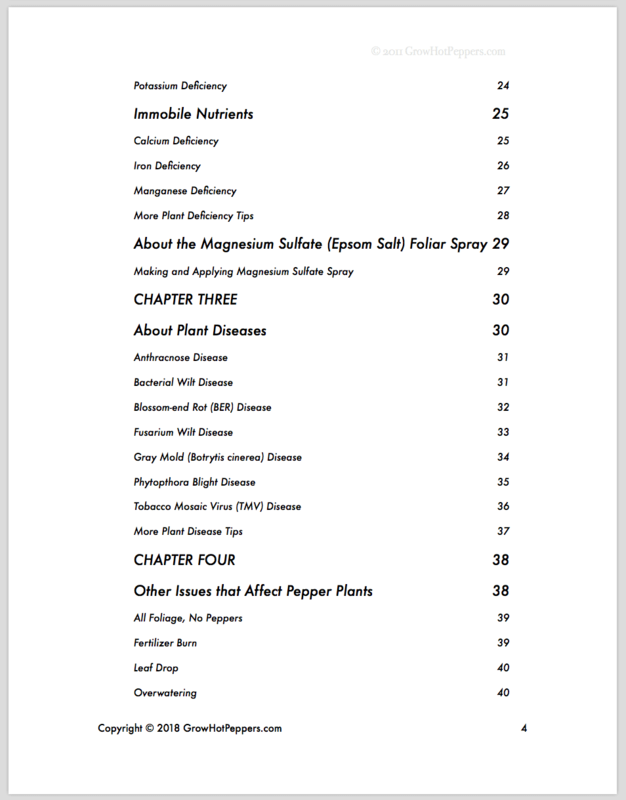 ​​This is the resource I use each year to take care of my own peppers. What ​Causes Yellow Pepper Leaves? Do you know the answer to this question? And, what would you do to remedy this?? There are a lot of reasons for leaves to turn yellow. 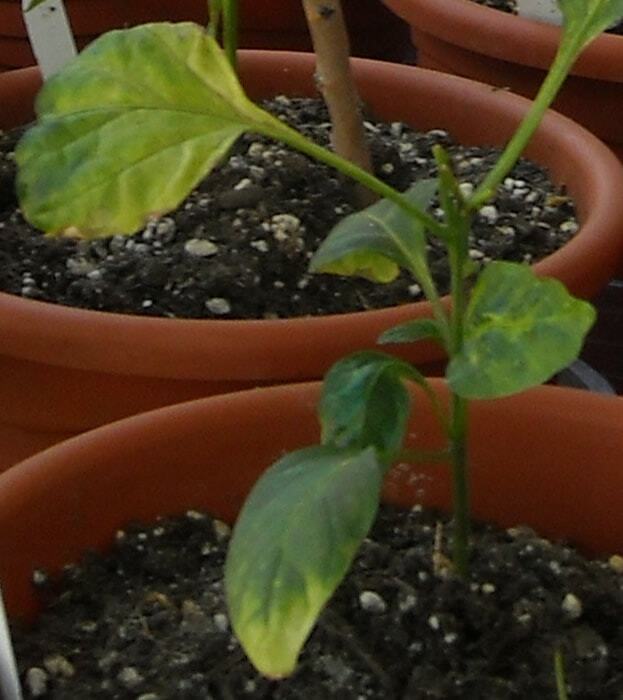 Yellowing leaves, however, often occur when the plant is lacking in magnesium -- an essential element of chlorophyll. Applying a fertilizer like CalMag, or sprinkling magnesium sulfate (epsom salts) around the base of the plant is very effective because it supplements this deficiency as well as allows for easier uptake of other nutrients like nitrogen and phosphorous. Plus, magnesium sulfate helps with blooming and fruiting too. Bonus! Q: Do ​You Use Organic Methods? ​Absolutely! We believe that organic pest/disease control is better for your plants, your peppers and the environment in general. 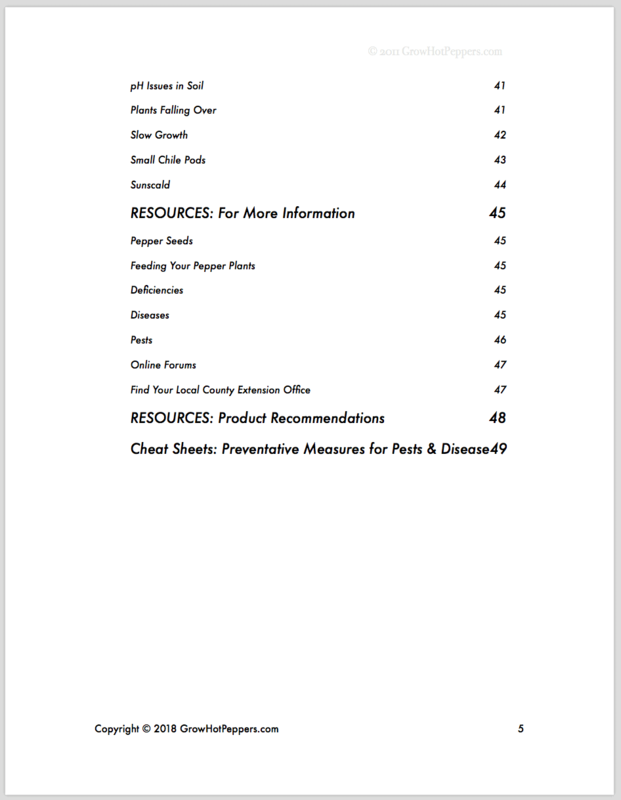 Your first lines of defense are good plant nutrition and beneficial insects, but you’ll learn other natural solutions too. ​Q: What Will I Be Able To Do With The ​Chile Plant Hospital? 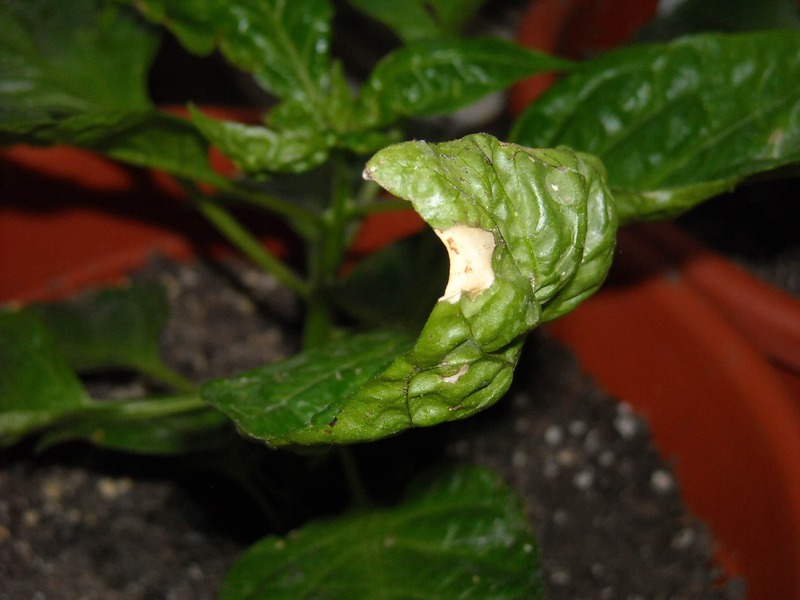 ​You’ll be able to recognize signs of pest damage, nutrient deficiency, disease and other issues that can affect your pepper plants. Each description will also include a remedy so you can take action immediately to correct problems before they get out of hand or affect other nearby plants. Q: ​How ​Will I Get My Purchase? 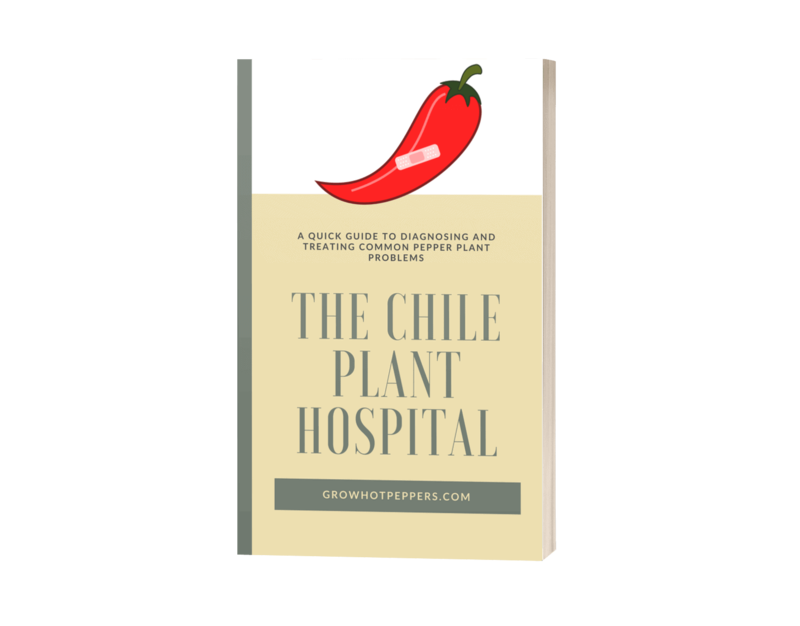 ​The Chile Plant Hospital comes in PDF format so you will instantly receive a download link after payment is received. You can access your e-book file on your computer as well as mobile devices. ​Q: ​Do You Offer Refunds?